On a prototype speed-of-light trip to Alpha Centauri, astronaut Brett Denton befriends the ship’s onboard computer Jay. But soon after Jay develops self-awareness and belief in God, one of them must make the ultimate sacrifice. 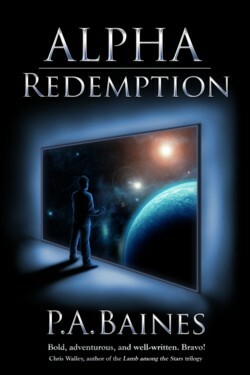 Science fiction for adult readers by P.A. Baines. Through tragedy he lived on, and journeyed to innocence. His trajectory: the stars. His companion: a computer poised at the brink of sentience. When astronaut Brett Denton loses everything in a tragic accident, he gladly accepts an invitation to take part in a prototype speed-of-light trip to Alpha Centauri, knowing that he may not survive. His only companion is the ship’s on-board computer, Jay. At first he finds Jay an annoyance but, as time passes, the two become friends. With the voyage drawing to a close, Jay develops a sense of self-awareness and a belief in God. When it becomes clear that they cannot both survive the return trip, one of them must make the ultimate sacrifice.